We deliver all orders over £600 +VAT (£720 inc VAT) for FREE within mainland UK. For orders less than this value, a carriage charge is applied to cover the cost of delivery. For orders between £400 and £599, delivery is £40. For orders between £200 and £399, delivery is £30 and for orders less than £200, delivery is £15. These prices are exclusive of VAT but this will automatically be calculated when you place items in your basket. For deliveries to Northern Ireland, Isle of Wight, offshore islands, the Highlands and some parts of Scotland, delivery will be quoted separately (please contact us for pricing). 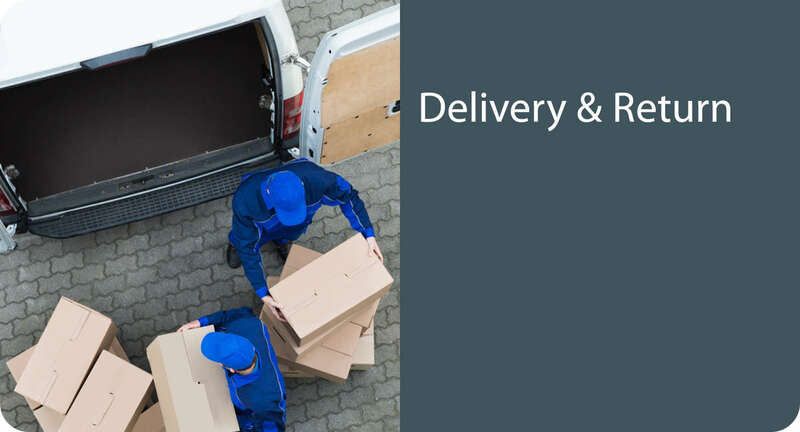 Standard delivery times are detailed on each product page, although very often we’ll deliver your order within a few days. If you’ve left things to the last minute and have an urgent requirement, we’ll do our very best to help, so please do enquire. If an item is out of stock, we’ll contact you to advise the lead time and/or to suggest a stock alternative. Parcelised Deliveries: these are made between the hours of 8am and 6pm to ground floor entrance only. We’re unable to offer a pre-call or a call-on-arrival service but, at your request, the goods can be left somewhere safe, eg. with a neighbour, in garage/porch (please provide instructions in the notes sections when checking out). Otherwise someone is required to be present at the delivery address to sign for receipt of delivery. Palletised Deliveries: larger orders will be kerb-side, palletised deliveries between the hours of 8am and 6pm on an agreed day. If required, we can offer a one hour pre-call. In the event of no one being available to accept delivery on the agreed delivery date, a re-delivery charge will be applied. Orders must be checked immediately upon delivery and any shortages or discrepancies must be notified in writing within 24 hours. If damage is suspected, please highlight to the delivery driver and sign for as "damaged". Returns: For goods ordered incorrectly or unwanted, these may be returned provided they are unused, unassembled, in their original packaging and in a resaleable condition. Goods to be returned will be collected by us or our carrier. A 35% restocking charge plus £29.95+VAT (£35.95) carriage charge applies. The value of your order will be refunded in full once the goods have been received and inspected.